The Bulli butcher shop when John Williams operated it. The dwelling to the left was the original home of the Floyd family. The house was demolished to make way for the current butcher shop at the corner of Park Road and the Princes Highway. The old butcher shop (centre) is still in existence. 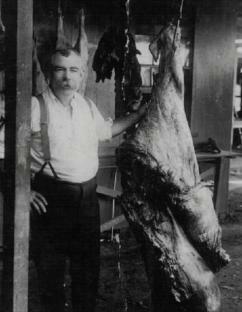 John Francis Floyd in his butcher shop at the corner of Park Road and the Prince’s Highway at Bulli. FOR over a century beef and beer were synonymous with the Floyd family name in Illawarra’s north. Four generations of Floyds were successful butchers and hoteliers leaving a legacy of a business empire that grew out of the 1860s. The dynasty began with John Floyd in 1867 and ended with great grandson Jim Floyd when he retired as a butcher in 1998. Butchering was inherited from generation to generation in the family, hitting its peak in the 1930s when two butcher shops, a slaughter house, and an ice works all traded from Woonona, Bulli and Thirroul. Along with the Bulli butcher shop, the Floyds had a store and ice works at Thirroul, and a slaughter yard in Popes Lane Woonona which was relocated to Organs Road Bulli in about 1925. The Floyd business empire began in 1867 at the Woonona Hotel, on the corner of Gray Street and the Prince’s Highway, from where 29-year-old John, better known as Jack, utilised his respected pugilistic skills to keep an orderly and profitable bar. The “jolly landlord”, with his wife Rosa later opened a new pub in 1869 at Bulli known as the Railway Hotel. The pub was named after the Bulli Colliery’s tramway, which ran past it to Bulli jetty. Sometimes referred to as the Miners’ Arms, Jack’s inn was located opposite today’s Hobart Street on the Princes Highway and, at the time was a favourite haunt of those who worked in the colliery. Jack was known for his short fuse and he fronted court a number of times for assault, cumulating in Senior Sergeant Sheridan opposing his license renewal application in 1873. Jack permitted gambling and disorderly conduct in his pub and “was not a fit and proper person to conduct a public-house,” according to Wollongong’s top cop. He was given a warning by the magistrates “not to allow his temper to get the better of him in future” and he continued behind the bar. He retired as a publican in 1879 placing his efforts into butchering, and died at Bulli aged 63 in 1881. Two of his six children would continue as beef and beer barons, with son James managing his father-in-law’s Black Diamond Hotel at Bulli, while another son John Francis worked at Thomas Farrell’s butcher shop on the corner of Park Road and the Prince’s Highway at Bulli. 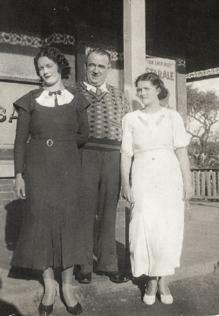 Olive and Jim Floyd with their daughter on the verandah of the Paragon Hotel, Helensburgh. When Farrell retired John Francis bought his boss’ business and with wife Florence helped build the family butchering dynasty. John Francis died in 1919, and his widow purchased the Bulli property managing the business. Florence had an excellent background in the trade with her grandfather, father and uncles all butchers. A third generation, three of Florence’s sons, also continued the trade with Jim Rupert running the Thirroul butcher shop and ice works, while brother John managed the Bulli shop and Harry worked at the Organ’s Road slaughter yard. In 1913, aged 24, Jim married Lily Owers, later leaving butchering to take-up the role of hotelier. He was granted the license of the Paragon Hotel at Helensburgh in 1932. After his first marriage ended, Jim remarried local girl Olive Viola Lindwell in 1935, hosting the pub until it closed in 1937 and later the nearby Centennial Hotel until 1956. Harry’s son Jim, who became the fourth and last generation butcher in the Floyd dynasty, and had a shop in Park Road East Woonona, recalled those depression years in Helensburgh. In 2006, at the age of 78, Jim, who was living in Bulli, told me that as a boy he boarded at the Paragon Hotel at Helensburgh in an enclosed section of the balcony, while his mother Alice and sisters June and Daphne were employed as cooks. He remembers his uncle Jim having a little fox terrier. The dog had a bar trick of stealing boxes of matches from the pockets of un-expecting customers, and tearing them to shreds. The Floyd butchering dynasty began to decline in 1939 when they sold their shops, ice works and slaughter yard. The Bulli shop was bought by Cecil and Hazel Williams. Hazel had come to the Floyd business as a book keeper in 1928 and her husband Cecil was hired as a butcher in 1929. The shop, run by Cecil’s son John for many years, continued trading in updated premises on the same site until recent years. 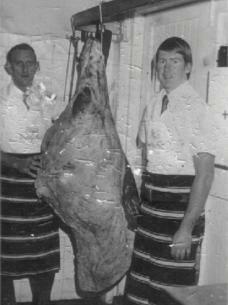 Jim Floyd with his apprentice Kevin Crick at his East Woonona butcher shop. Jack Gwyther, later host of the Bulli Family Hotel, purchased the Thirroul shop, slaughter yards and ice works. Harry Floyd’s son Jim became the last family butcher when he received an apprenticeship at the Illawarra Meat Company at Woonona in about 1942. Illawarra Meat Company was located opposite Hopetoun St on the Princes Highway. He married in 1946 buying his first butcher shop at East Woonona in 1963 and later a shop on the highway opposite Bulli Public School. He retired as a butcher, aged 72, while working for Woolworths in 1998. Meanwhile Kerri Flick of Sydney recalled her grandfather Jim Rupert Floyd, who hosted the Paragon, as being an excellent business man and used his inherited wealth to start out in the hotel industry and build his fortune by working hard and putting in long hours. Kerry said he was involved in the formation of the now defunct Helensburgh Bowling Club. In 1951 he and Bill Soper planned the green for the club which he regularly attended for relaxation. He was also the treasurer of a committee which was formed to get an ambulance service for Helensburgh. ”I can remember in the late 50s as a child, his beautiful home at Carrs Park (Sydney) and he had a duck which he kept in the backyard, and I recall he drove a Rolls Royce,” she said. Jim Rupert Floyd died aged 77 in October 1966, just short of a century from when his grandfather began the beef and beer dynasty by establishing a butcher shop and miners’ pub at Woonona. Jim is buried in a lone grave at Woronora cemetery. His brother Harry died in about 1975.